Mock corded pillows are corded after the pillow is assembled. Cut pillow front 1″ (2.5 cm) larger than the finished pillow. Cut back the same length as front. For hook and loop tape or zipper closure, add 1-1/2 (3.8 cm) to back width; for overlap closure, add 5-1/2′ (14 cm). Decorator fabric for pillow front and back. Hook and loop tape or zipper, 2″ (5 cm) shorter than length of pillow. Cord, ‘1/2″ to I” (1.3 to 2.5 cm), equal in length to distance around the pillow. Pillow form or knife-edge liner. 1) Insert hook and loop tape or other closure in center of pillow back, Trim corners of front and back into curves. read more...Pillow Closure | how to sew side seam closure | how to insert center zip in a pillow back. 2) Pin front to back, right sides together. Stitch IN’ (6 mm) seam around entire pillow. Turn pillow right side out. 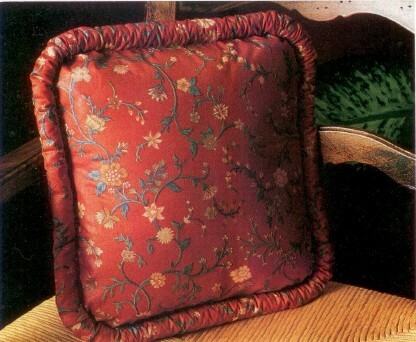 3) Pin cord inside pillow, as tightly as possible against seam. Ends of cord should just meet. 4) Stitch cord from right side, crowding stitching against cord, using zipper foot. Leave 3″ (7.5 cm) opening where cord ends meet. 5) Pull out cord about 4″ (10 cm) at each end to gather. Adjust gathers. Cut cord so ends just meet. Tack ends together. 6) Top stitch opening closed, using zipper foot. Start and end stitching on previous stitching lines. Insert pillow form or liner.